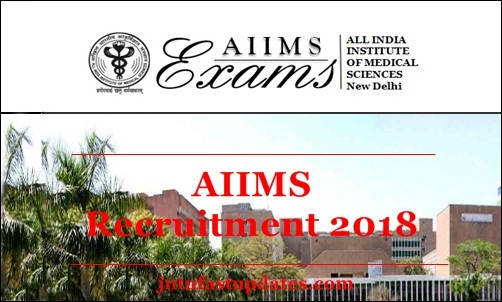 AIIMS Nursing Officer Recruitment 2018: All India Institute of Medical Sciences, New Delhi released the recruitment notification for 2000 Nursing Officer (Staff Nurse-Grade-II) – Group ‘B’ posts. Aspirants waiting for AIIMS Nursing Officer recruitment notification can check more details from this article. AIIMS inviting applications from the eligible and interested aspirants from 8th October to 29th October 2018. Candidates having the suitable educational qualification and eligibility standards can apply through online at aiimsexams.org. The online application form is now accessible on the official portal. By just visiting the website, aspirants can apply for the Staff Nurse Grade II posts. Candidates interested to apply for AIIMS Staff Nurse Gr II posts can check more details of eligibility criteria, application process, selection process and other details from the following article. The All India Institute of Medical Sciences, New Delhi is the central government organization that is well-established in the medical sector. Many of the aspirants will dream to get the jobs in AIIMS annually. The organization releases various job notifications to hire the suitable aspirants into various posts. This year the AIIMS Delhi released the notification for 2000 Nursing Officer (Staff Nurse-Grade-II) – Group ‘B’ posts. Candidates will be shortlisted through written test, interview rounds. Candidates shortlisted through the selection process will get jobs in Bhopal, Jodhpur, Patna & Raipur. Aspirants seeking central government jobs and having the suitable eligibility standards can apply through online on aiimsexams.org. Candidates seeking to apply for AIIMS Nursing Officer/Staff Nurse Grade II Posts can refer to the notification [official] for more details. Here we gave the brief details about AIIMS Staff Nurse Recruitment 2018. Candidates must have completed their B.Sc (Hons.) Nursing / B.Sc. Nursing from an Indian Nursing Council recognized Institute or University. Age limit of applicants must be in between 21 to 35 years. The age relaxation will be applicable for suitable candidates as per the norms. Nursing Officer (Staff Nurse-Grade-II) – Group ‘B’ – Rs. 9300- Rs. 34800 with Grade pay of Rs. 4600/- per month. How to Apply for AIIMS Staff Nurse Posts 2018? Candidates having the suitable eligibility standards can apply within 8th Oct to 29th Oct. The AIIMS Staff Nurse Application form is presently accessible on aiimsexams.org. By visiting the portal, aspirants can fill the online application form during the specified dates. 1.2 How to Apply for AIIMS Staff Nurse Posts 2018?